Today I heard the news that Patrick Roy has resigned as head coach of the Colorado Avalanche. What a shame. I liked seeing him behind the players' bench. It sounds like there were some differences between the way things are done in the organization and the way that Patrick wanted to do them. I'm sure we haven't heard the full story and may never hear it. Both sides say that it was amicable and that Roy and Sakic will be on the golf course together in a few weeks. Now we're left wondering who will be the next head coach. The search is on. I wonder what Bob Hartley is doing these days? He's no longer with the Calgary Flames and he did win the cup with the Avs in 2001. 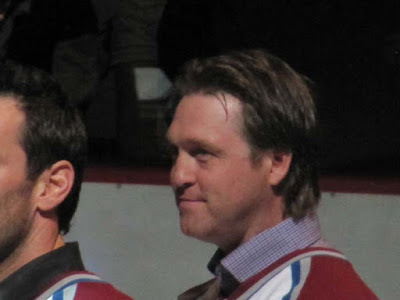 Here's a picture that I snapped in 2010 when the Colorado Avalanche was celebrating 15 years of being in Denver and many of the original players returned for the event. It's a little blurry, but no mistaking it's Patrick Roy between his days as a player and his days as the head coach. I wonder what's next for him? I heard a rumor on the radio today that he might be heading to Montreal to lead the Canadiens.